Three UK's chief executive told BBC News there would be enough capacity on 5G to cope with demand, meaning households would be able to save money by ending their fixed-line contracts. But one expert warned against "hype". Its announcement coincides with news from BT's mobile division, EE, that it has switched on nine 5G trial sites in London. In theory, 5G could offer download speeds of up to 10 gigabits per second or even 20Gbps - although these are unlikely to be attained for many years if at all. As part of its pitch, Three is making the case that 5G will offer a "genuine alternative" to fixed-line copper and fibre services. "Maybe not for the whole country, but certainly a significant majority of the country, I strongly believe 5G can offer a good enough home broadband experience for people to effectively ditch their copper [or fibre] connection," said David Dyson, Three UK's chief executive. "The challenge in terms of why we can't do that today is that the mobile networks don't have the capacity with 3G or 4G. 5G changes all of that." Three already provides a 4G-based "unlimited data" home broadband service in London, called Relish, which it acquired last year. "Stability is important for video streaming at HD and Ultra HD quality levels, and paramount for the gaming community," said Andrew Ferguson, from the news site Thinkbroadband. 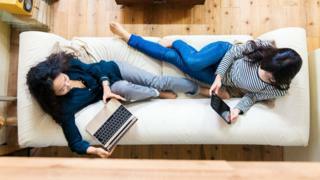 "Full-fibre services are going to beat 5G as you have a connection as stable as the one that will be feeding the mobile masts and thus the variables of signal strength dropping due to a bus passing the home are avoided." The government is currently pursuing a target of "full-fibre" broadband coverage to the whole UK by 2033, in which high-speed optical cables are used to bring data right up to buildings without having to rely on slower copper for part of the journey. But Three's chief executive suggested the cost involved could help make 5G a more attractive option. "Fibre-to-the-home for the small number of customers who value it and need it will probably provide a faster speed," Mr Dyson said. "But I think for the majority of people, 5G will be a genuine alternative. "It's expensive to dig up roads. It takes a lot of time and money. "It's much cheaper and quicker to provide that connectivity via a wireless connection."